They just don’t make ‘em like they used to… sometimes when they try, they make ‘em even better. More than three decades ago, a couple of unknown dudes named Ron Gilbert and Gary Winnick teamed up at Lucasfilm Games to make a multi-character, puzzle-filled, non-linear adventure, and created a whole new verb-based, point-and-click control scheme named for the game (the SCUMM acronym stands for Script Creation Utility for Maniac Mansion). Like many innovators, the result wasn’t nearly as refined as others would go on to be, but the game seriously reshaped what adventure games could be and helped usher the genre into its Golden Age of popularity. But that was then and this this is now, and never the twain shall meet, right? Well, hold on. 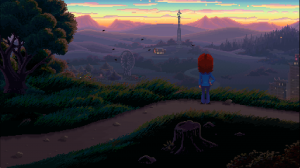 Thanks to the (rapidly fading) miracle of Kickstarter, in 2014 Gilbert and Winnick reunited at long last for another adventure called Thimbleweed Park. Slyly promising “the best adventure game you never played in 1987,” it was to be a pure throwback in most respects, yet updated with current features. The ultimate goal was to not only give players the same experience they had back then, but the experience they remember having. Bold claims… and yet that’s exactly what they delivered! Thimbleweed Park truly feels like a return to the genre’s halcyon days. At a time when most adventure are getting shorter and simpler and increasingly streamlined, Gilbert and Winnick unapologetically created a substantial, highly amusing player experience with rich interaction, expansive open-world environments to explore, overlapping objectives, a multi-layered murder mystery to uncover, unique characters both to play as and converse with, and a serious lack of hand-holding in solving the many puzzles encountered. A few rough edges aside, this is point-and-click adventure gaming, baby! Fortunately, the designers didn’t go back 30 years technologically. Sure, the game is still presented in a deliberately retro style, but these ain’t your parents’ pixels. The artwork is beautiful here in all its high-resolution glory, the many environs generously animated along the way. The various voices are wonderfully performed and the score is diverse, seamlessly transitioning to enhance the different atmospheres in this unsettling town and its ever-dwindling population of 80. 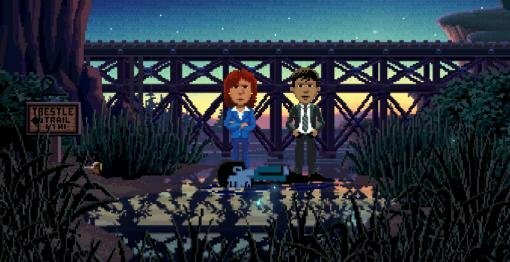 Thimbleweed Park isn’t a perfect game – what game is? – but there’s really nothing it doesn’t do well. (It may not have won many of the previous individual staff awards, but it seriously contended for most!) We’re very conscious here at Adventure Gamers of NOT over-glorifying a rose-coloured past, but this game would have stood proudly among its SCUMM-era peers – not all the way back to the hardware-challenged 1987, but rather the beloved classics from the early to mid-‘90s. Here in 2017, it’s a welcome nostalgic experience that nevertheless manages to put most of its modern contemporaries to shame. There were definitely some great competitors, but for successfully making everything old (school) new again, Thimbleweed Park earns this year’s top Aggie Award for Best Adventure. Whaaaaat? Thimbleweed Park, you say? Never saw that coming! Well, okay, as experienced adventure gamers well-versed in piecing together cryptic clues, perhaps we had an inkling that the winner of a whopping seven previous awards would walk home with the grand reader prize as well. That and the fact that we fully agree! Cynics might argue we’re all stuck in the past, but where other genre legends returned to the fold and couldn’t fully recapture the old magic, Ron Gilbert and Gary Winnick managed to meet our expectations and then exceed them. Thimbleweed Park would be on a short list of top games any year, and this year it’s number one with a bullet (quite literally). Ladies and gentlemen, your Best Adventure Game of 2017. At last the curtain closes on another Aggie Awards presentation. Before we go, we would like to express our gratitude to ALL the hard-working developers who made the year so much fun, and to our community for participating in our reader poll (and of course, for continuing to follow and support the genre here at Adventure Gamers). After an unprecedented number of new releases in 2017, we’d like to take a break, but already 2018 beckons with no signs of slowing down. And so we must end the frivolity and bid you all adieu so we can get back to work! Glad you tuned in, and we hope you enjoyed the event. Same time next year?